I hope you had a wonderful weekend. I had a great weekend in Toronto. I met an amazing group of woman. I ended up being the only US participant in copic class. The women adopted me and took me to some Canadian restaurants. It was a lot of fun!! I have a lot of stuff to share with you from the convention, but I'm still getting my thoughts organized. 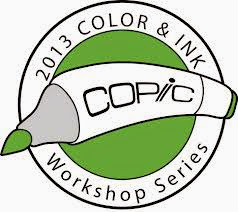 I'm going to design a Copic Hair and Copic Skin class. I thought I could do it all in one class, but there really is too much information to be just one class. This is a card that I made before I left. I have colored this image many, many times but I always have to give it away when I finished. This time I wanted to color it for myself. I chose my favorite color combinations. They are listed below the photos. AWE... they are so sweet!